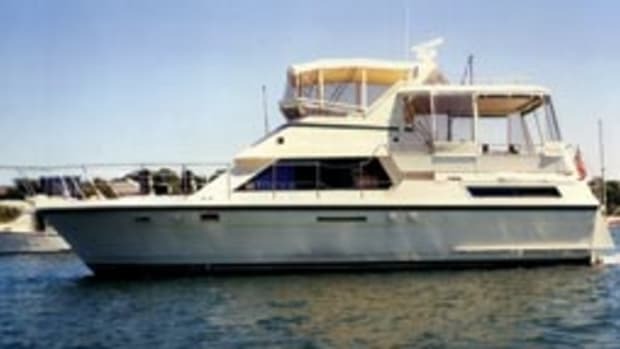 Buying a 43-foot trawler without your wife seeing the boat first? Some might consider that a risky move, but for Sandy Fink, it wasn&apos;t much of a stretch. 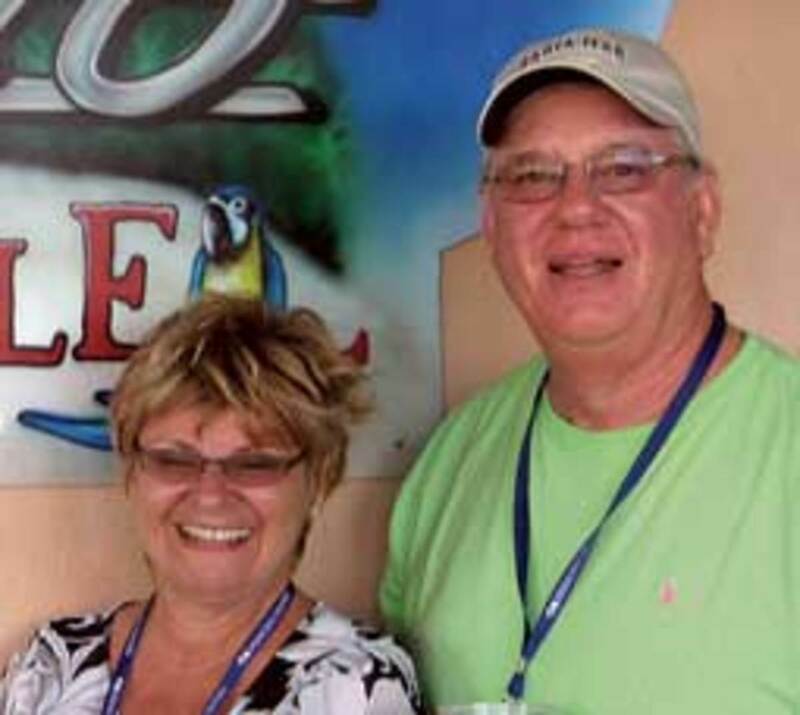 The 64-year-old retiree and his wife, Fran, agreed they were interested in buying a trawler, with the shared intention of cruising out of their home port in Warwick, R.I.
They&apos;d already looked at lots of boats together and knew each other&apos;s tastes. They even agreed on the builder. "We&apos;d been looking together at Mainship&apos;s 34-foot and 40-foot sedan trawlers, traveling from Maine to New York," the retired auto salvage company owner says. "We got real good at rating the boats as to our needs." 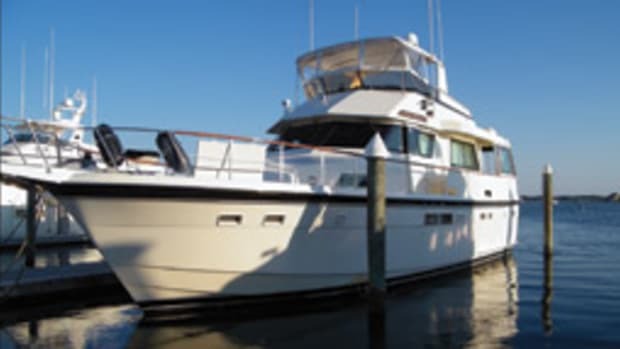 Last fall, Fink heard about a clean, well-priced 2003 Mainship 430 aft cockpit located in southern Connecticut and arranged with listing broker Hank Aldrich Yacht Sales (www.hankaldrichyachtsales.com) in Essex to have a look. "The first time I saw her, I mumbled, &apos;Holy cow!&apos; She was so beautiful and big," Fink says. 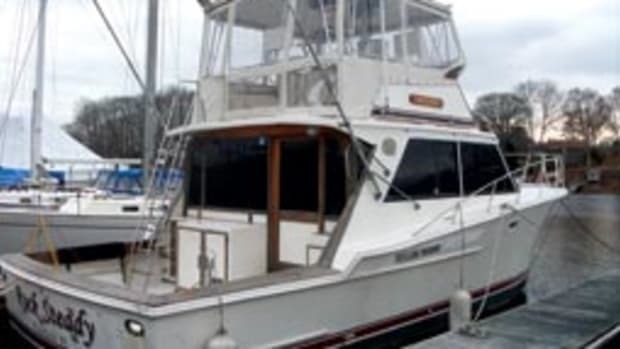 The trawler was priced to sell, and after a sea trial, haul-out and an extensive survey, Fink made an initial offer of $180,000, which was accepted. "I did this without my wife seeing her, but we agreed it was contingent on her OK&apos;ing the boat," Fink recalls. It was a nervous walk down the dock to show her the 43-footer. "What would her reaction be when she saw the boat? Well, it was almost the same as mine," Fink says. "Once Fran came aboard and saw the living space, she was won over." Using a broker to handle the sale is the only way to buy a larger, more expensive boat, says Fink, who has bought and sold his share of vessels during the last 15 years, including a 24-foot Stingray cuddy, a 34-foot Californian and a Cruisers 340. "They handled all the negotiations with the owner and the surveyor, and got our information to the financial and insurance people," he says. "They were a big help." The Mainship was in turnkey condition and came "pretty well-equipped," Fink says. Electronics include a Raymarine RL70 plotter/radar at the lower helm and an RL80 on the flybridge, along with a wind/speed indicator. "I had the new Garmin 5208 HD touch-screen plotter/radar on my other boat, but that will have to wait for another year for that upgrade," Fink says. The couple plans some cosmetic fixes, such as replacing the Isinglass on the flybridge. "The first mate has been shopping all winter, buying new lamps, bedding and a new oriental rug for the saloon," he says. Power comes from twin 440-hp Yanmar diesels. 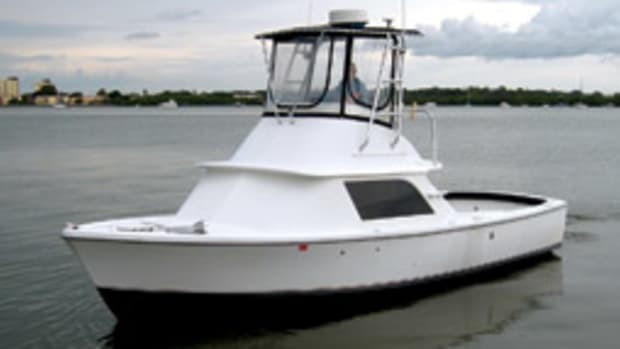 "The nice feature of the Mainship is that you can run at displacement trawler speeds of 8 knots and burn 5 gallons an hour or increase to 10 to 12 knots and burn 10 to 12 gallons an hour - not bad for a big, heavy boat," Fink says. "And it&apos;s nice to know that you have the speed available to outrun a storm or if the grandkids are waiting for us at the dock." 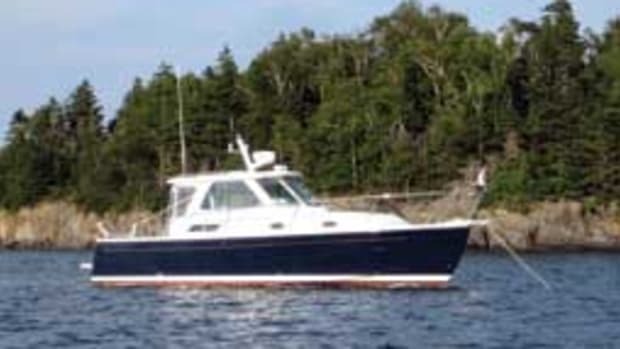 Although the Finks have had the trawler only a short time, it has already shown itself to be a seaworthy boat capable of handling foul New England weather. 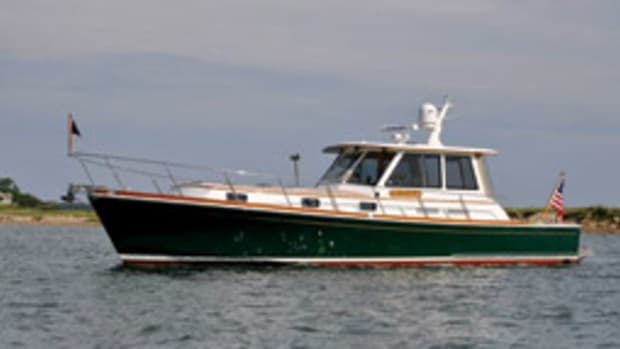 "When [broker] Mike Farman and I took her north to Narragansett Bay after I bought her [last October], the weather was nasty, with 6- to 8-foot seas and 25-knot winds," Fink recalls. "She took the rollers on her starboard beam most of the length of Long Island, past Fishers Island to just off Block Island, cruising the whole time at 12 knots. Other boats around us were taking blue water over their bows, but she was amazing. Those twin Yanmar 440s just powered us up and over the head and following seas." 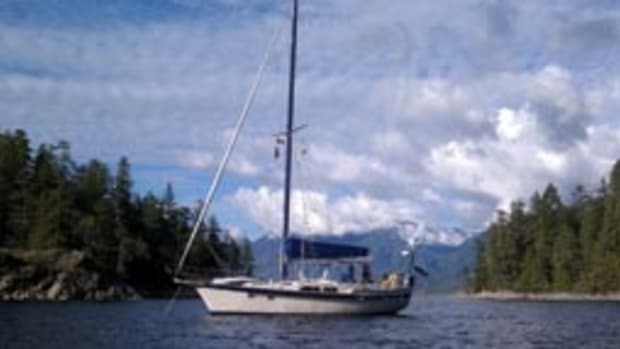 With the bigger boat, the couple is looking to broaden their horizons. "We&apos;ve always enjoyed mooring out in Newport, Jamestown and Block Island, R.I.," Fink says. "With our smaller boats we were restricted on how long we could stay out. With this boat and its 500 gallons of fuel and 250 gallons of water, we have little concern. ... Because of the size and capacity of Sand Dollar we are looking to expand our cruising area." Children and grandchildren will appreciate the Mainship&apos;s expansive layout, too, Fink says. It includes the aft owner&apos;s stateroom, a forward stateroom, a full saloon and galley, twin helm stations and two enclosed head compartments. "Now that we have an even larger family, the size of the saloon, galley and the huge flybridge made the decision to go large much easier," he says. Ed McKnew, in his "PowerBoat Guide," calls the Mainship 430 an "affordably priced aft-cabin cruiser with very spacious accommodations and a good turn of speed." With 370-hp Caterpillar diesels, the 430 tops out around 20 to 22 mph - larger engines will push that close to 25 mph - adding the element of speed to its trawler-cruising characteristics. The layout features both flybridge and lower helm stations, a large saloon (thanks in part to the boat&apos;s 15-foot, 6-inch beam) with a full couch, a dining table for four and a countertop "bar" with two stools. The owner&apos;s stateroom aft is laid out with a queen walk-around berth placed athwartships and a private head compartment with shower. The forward stateroom is similarly equipped, with a centerline queen berth and its own head compartment. The galley-down amidships has a three-burner stove, a full-size oven and a large double-door refrigerator, along with a stainless-steel sink, a microwave and plenty of counter and storage space. A galley-up three-stateroom version also was offered. There&apos;s passenger seating for as many as eight on the flybridge - laid out with a centerline helm - and more room on the quarter deck, over the aft stateroom. A private entry connects a small aft deck and the owner&apos;s stateroom. received sedan- and trawler-style cruising boats. 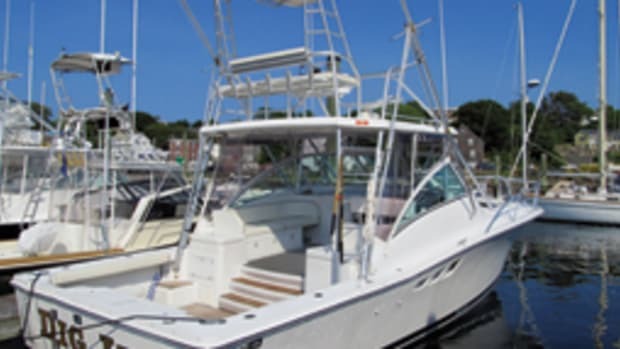 As part of the Luhrs Marine Group, which also includes Hunter sailboats and Silverton and Luhrs powerboats, Mainship today offers five models from 35 to 47 feet in its Pilot and trawler series. Prices for used 430s range from about $200,000 to more than $300,000. 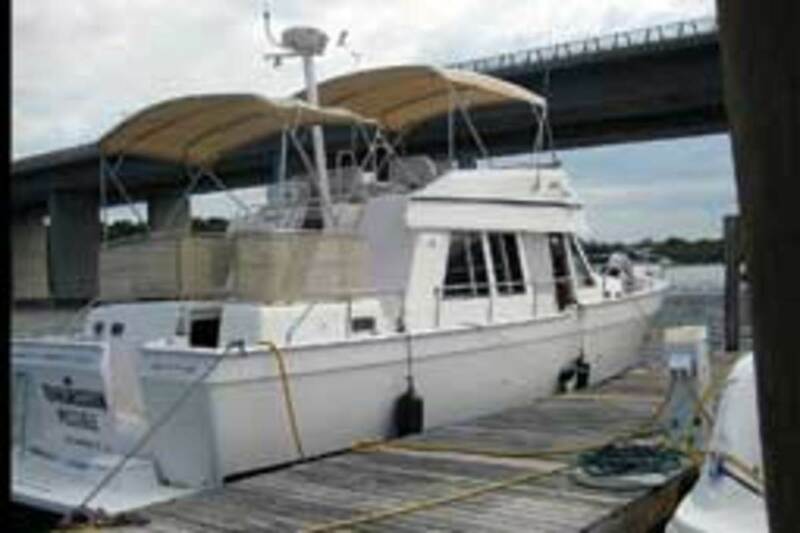 BUILDER: Mainship Corp., Millville, N.J.
Click here to find more Mainship boats.